Following on from a look at export levels here, we can also use the latest CSO External Trade release to look at Ireland’s trading partners. The following table gives the top 12 destinations of Irish exports in millions of euro, along with the remaining exports to other EU countries and other worldwide countries. The table gives the percentage change from the same period in 2008 in exports to this country and the proportion of total exports that go to that country. After the US, the biggest destination of Irish exports is Belgium, taking nearly 18% of the total exports. Belgium is the biggest destination of Irish exports in the EU, overtaking Great Britain and is more than three times greater than either France or Germany. Exports to Belgium also show strong year-on-year performance with a 22.1% increase on the same period in 2008. The equity principle that underlies most tax system suggests that those who have a higher income should pay a greater proportion of their income in tax. This progressivity is clear if we consider income tax, but absent for corporation tax. Using data from the Revenue Commissioners 2008 Statistical Report we can draw the following graph. This gives the effective tax rate on labour on wages up to €200,000 (lower axis) and the effective tax rate on corporations on profits up to €10,000,000 (upper axis). We see that the tax rate on labour rises with income, from 0% up to about 28%, while the tax rate on corporations is around 11% for all profit levels. Why should a company that earns a profit of ten thousand pay the same rate of tax as a company that earns a profit of ten million? Why is the corporation tax not progressive? This is why it’s so frustrating to hear talk of blue ribbon commissions assigned to the task of “debt reduction”. “Debt reduction” can mean less spending, or more taxes, or some combination thereof. But to raise taxes solely for the purpose of debt reduction is to mask the problem, not to solve it. Debt is not the problem; spending is. Hysteria about the debt is misdirection. On Thursday the CSO released the January update of the Consumer Price Index. The figures reveal that the annual rate of inflation -3.9%, the highest (least negative) it has been since April 2009. However, if we look at a measure of 'core inflation' we actually see that the inflation rate is still declining. Here core inflation is the CPI excluding mortgage interest and energy. The prices of these goods are largely external to the Irish economy. 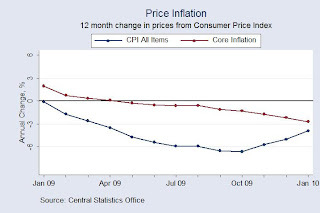 Here is a graph of the overall CPI and core inflation annual rates. Click to enlarge. The number of new cars registered last month is up 5% on January 2009, according to new figures from the Society of the Irish Motor Industry. 16,595 new cars were registered in January 2010, compared to 15,799 in January last year. This is the second consecutive month showing an increase. See also reports in The Irish Times and The Irish Independent. But as with so much economic commentary (spin?) things are not always as they appear to be. 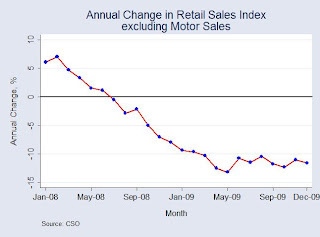 This morning the CSO published the Retail Sales Index for December. The release gives the final retail sales figures for November and preliminary estimates for Decemeber. As with many other indicators the data show the rate of decline in the economy accelerating. Here is a graph of the annual change in the value index excluding motor sales for the past two years. The annual decline accelerated in December to -11.6% after being -11.0% in November. See the downward trend in the actual index in this graph. No sign of any corner being turned here. By volume the rate of decline accelerated from -5.9% to -6.7%. Graph here. Volume is falling at a slower rate than value as retailers are reducing prices to try and increase the quantity of sales. They are failing. The best example of this can be seen if we compare the value and volume sales indices for Department Stores. The CSO have released theie latest version of the Women and Men in Ireland publication. The release provides some interesting statistics across a range of areas: population, employment, lifestyles, education, health, crime and transport. From a third level education perspective there are some interesting patterns. 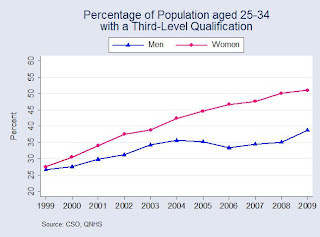 Here is a graph of the percentage of the population aged between 25 to 34 who have a third level qualification. Click to enlarge. Courtesy of Google Video here is a good documentary on the current state of copyrights in the world. I presume the creators have ceded the copyright on the documentary. The Economist carries a piece that considers the fiscal crises facing many eurozone countries. They put particular emphasis on Greece and in doing so provide a contrast to the Irish situation. The planned cuts to the public-sector wage bill look small when set against such a large budget deficit. They also look timid when compared with the much bolder action taken in Ireland, another cash-strapped euro member. In December the Irish government announced big reductions in civil servants’ pay, only months after it had introduced a “pension levy” that cut public-sector wages by 7%. Its courage has been rewarded with lower borrowing costs. Ireland is small, too, but its government has shown itself willing to take unpopular decisions to right its public finances. 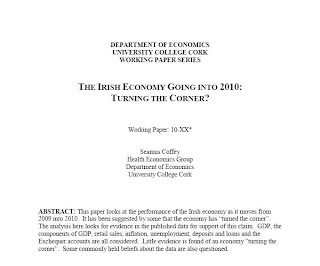 The Irish economy is more flexible so its medium-term prospects seem brighter. The economy grew slightly in the third quarter of last year. There are even signs that tax revenues are recovering. So everything must be hunky dory so. Not so I'm afraid.